1 LORD, avenging God, avenging God, shine forth! 4 How long will they mouth haughty speeches, go on boasting, all these evildoers? 6 They kill the widow and alien; the orphan they murder. 8 Understand, you stupid people! You fools, when will you be wise? 9 Does the one who shaped the ear not hear? The one who formed the eye not see? 11 The LORD knows the plans of man; they are like a fleeting breath. 13 To give rest from evil days, while a pit is being dug for the wicked. 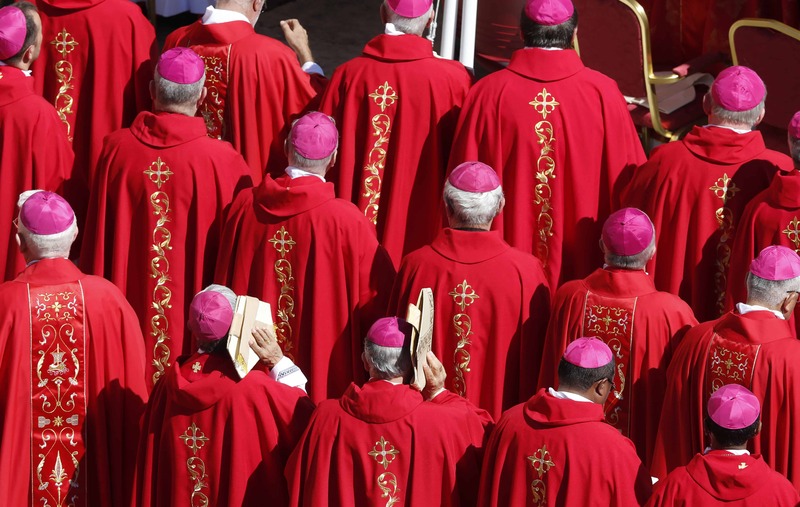 Under the guise of a renewal and regeneration of the Catholic Church, all the clergy, within this Church, will be sent on retreats to encourage them to accept the new apostolate. These will become widespread and many will be told that the objective is to unite everyone in the world, in the name of justice.This new mission will, they will be told, embrace the world’s poor and strive to bring about unity. They will be asked to pledge their allegiance, through a new oath, to remain faithful to the Church. They will not be asked to place their faith in Me or My Holy Word. Instead, they will swear allegiance to the new self-proclaimed leaders who have taken over the Chair of Peter. Make no mistake that those who have been bestowed with the Gift of Holy Orders will be asked to participate in a falsity, where I, Jesus Christ, will not be at the forefront, though it will appear to be the case. Money will be a driving force and a new financial organization will be set up to control the seeking of funds to ensure that the world’s poor will benefit. When you amend your Holy Orders, in any way, and then pledge your life to someone who breaks all ties with Me, you will no longer be fit to serve Me. Everything will be seen to be made simple in the Eyes of God. The plan will be to convince those sacred servants of Mine to take part, willingly, in the abomination, which will link society and a secular world with the Church, which was set up by Me, Jesus Christ. This is how I will be insulted. Every effort to embrace secularism will be applauded by non-believers and this will be seen to be a good thing, for the new, so-called modern society of today. It will soon seem strange to Christians when they see members of the secular world embrace the Catholic Church, so enthusiastically. But many will brush off their doubts and dismiss their concerns, as they will fall for the great deceit. At the kernel of this plan to revolutionize the Church lies a hatred for Me and everything that I gave My Church. You must question everything in the days ahead. Demand answers when they change My Teachings and twist them to suit pagans. No disciple, appointed by Me, would ever be given the authority to do this, for it amounts to blasphemy. Virgin Mary: The Arrogance and Pride of Humanity is Insulting to the Presence of God. My Holy Mantle covers all those of you who call on me, your Heavenly Mother, during these times of Chastisement. As the Anger of my Eternal Father increases, you, my dear children, must pray hard to dilute the suffering, which will surge, like a flood, over the earth. You must keep focused on what my Son tells you and remain united in prayer, so that sin can be forgiven. The hedonistic cloud, which hangs over the western part of the world, which has shunned my Son, thickens every day. The arrogance and pride of humanity is insulting to the Presence of God. Their empty souls are like empty vessels, and they are filled with worthless riches, which are created by the hand of man. No room do they have in their greedy hearts for True Love, the Love of God.Without the Love of God, they are unable to love anyone, other than themselves. This means that humanity suffers, more than they should, because love is not shared. If you only care for yourself, you cannot give comfort, or ease the suffering of those who are reliant on others. Wake up, children. Only by opening your hearts to the Truth will you be able to win over the Mercy of my beloved Son.